Basically, it’s a plate of sweet deliciousness. I get teased by my family for never trying anything different. But why would you if you could choose fruit pancrepes? Just look at them! 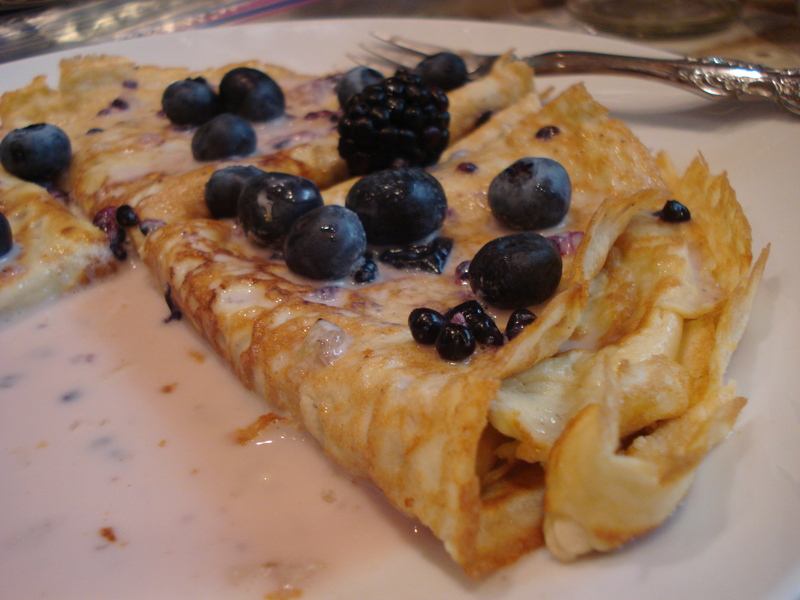 I’ve tried a few times at re-creating Cafe Brazil’s fruit pancrepes… and I succeeded (or at least I did in my mind) back last year when I used an Alton Brown crepe recipe, some creme anglaise recipe I found online, and another raspberry sauce recipe I found somewhere else online. Those recipes are not paleo-friendly though… so I had to come up with a new approach. So I found this recipe from FastPaleo and improvised. And they aren’t half-bad. I follow the recipe directly from the FastPaleo version, with the only modification being that sometimes I like to add a dash of pumpkin pie spice or cinnamon to the batter for a little extra niceness. After the crepes are made and arranged in their folded triangles on my plate, I try to capture the essence of Cafe Brazil’s fruit pancrepes by making my own paleo-version of creme anglaise sauce to pour on top. It’s pretty simple: mash up some berries of your choosing with a fork in a little bowl, pour in some canned coconut milk, stir it up, and pour that on your crepes. Add some extra berries/fruits to your liking. If you really need it, you could sweeten the creme sauce by adding a little honey or maple syrup…but I think the berries add enough sweet flavor. There you have it. The paleo option for Cafe Brazil’s Fruit Pancrepes: my favorite brunch meal in Dallas.